In 1996, Dr. Berne had a vision to bring full service, removable prosthodontic care to patients from Atlanta to North Carolina. Committed to offering patients every advantage, GDIS added a full service, on-site dental lab to address the needs of those replacing missing teeth with implants, partial and full dentures. While having the lab in office does allow for quicker turn around time, it’s more important function is to enable chair side consultation between doctor, patient and the technicians custom crafting the removable prostheses. This direct communication between patient and specialist enables the patient to share any difficulties they have chewing or speaking, as well as their hopes for an ideal smile. Wax try-ins will be available so that patients can see what their future smile will look like. This collaboration, coupled with personal knowledge of the patient, allows Georgia Denture & Implant Specialists to offer custom, quality dental work that brings back a patients smile and ability to chew comfortably. Of course a lab is only as good as the technicians who staff it. 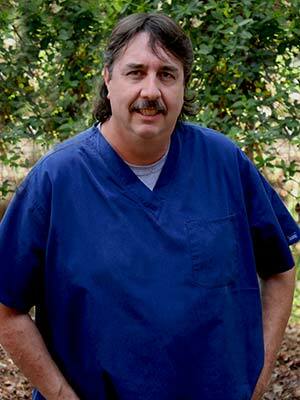 Georgia Denture & Implant Specialists is proud to offer the talents of William, Dave and Rosa. Working hand in hand with Dr. Berne, Dr. Anderson, and Dr. Yoon, this collaboration of doctors, technicians and patient assures you that your finished denture will not only function well, but look naturally like your own smile. Denture mishaps, though rare, often happen at the worst possible time. Having an in-house lab allows for repairs while you wait, with the least amount of inconvenience (often without an appointment). Repairs can even be done for dentures belonging to a patient not currently under GDIS care. Quality, “while you wait” denture repair for Woodstock, Atlanta and all of North Georgia, makes the short drive to Woodstock worth it! 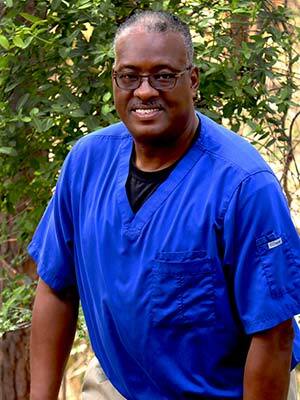 Originally from Preston, GA, William Holloman studied at the Atlanta College of Medical and Dental Science and in 1975 attained his certification as a dental technician (CDT). Bill brings his years of experience to every facet of custom prosthodontic fabrication, from denture setups to finishing, polishing and denture repair. Bill shares that in his ten years at GDIS, he most enjoys seeing the positive impact their professional care has on patients lives. Caring doesn’t end at the lab door, this proud, married father of one, volunteers at the Briarcliff Nursing home, when not enjoying golf or music. Whether you’re getting new teeth or having a repair done, David, our in house lab technician is part of the reason why our patients’ teeth will always look amazing. He is behind the scenes in our lab, setting teeth, doing repairs and helping to make sure every set of teeth makes our patients happy. “There is no better feeling than seeing a patient come in with no hope and leave happy and confident because of the work we do”, he says. A native of Wisconsin, David was born, raised and graduated college in his home state. 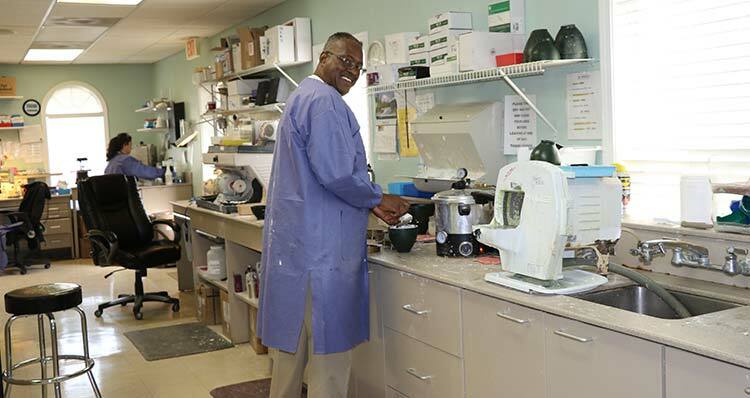 He has a specialized Board Certification in crown and bridge, ceramics and denture repairs, which makes him an integral part of our lab team. In the off hours, he enjoys spending time with his wife, two children and their pet guinea pig. Another fundamental part of our lab team is Rosa. She was born in Lima, Peru and has spent the last 27 years living in the United States. While helping with repairs, she also makes custom trays, pours models and helps with impressions. 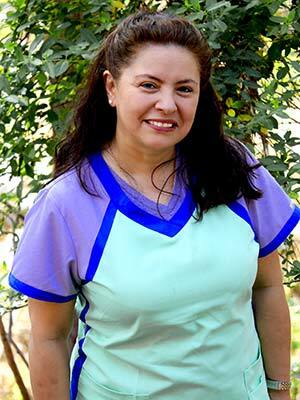 Rosa’s work ethic, expertise and personality are what makes her so important to our in house lab and family. She earned a Dental Laboratory Technician degree that gives our lab technicians a vast array of experience and know how. She enjoys many different activities and working with her hands which makes this the perfect job for her. May you know how much you and your lovely staff have aided and comforted me at a very traumatic juncture of my dental challenge/experience. You were disadvantaged and faced unfavorable conditions for achievement when you took my case. So, thank you sincerely for taking the challenge and successfully providing me with my beautiful teeth. Thank you for your professional expertise, and thank you for your kind and thoughtful ways. The folks at GA. Denture & Implants Specialists are great! For a long time, I delayed the inevitable denures, but I was immediately at ease and confident that everything would be just fine. I was right. After spending years of hiding my smile, I now am comfortable and smile BIG! I actually look forward to my visits. I highly recomment Dr. Berne for any prosthetic work you need done. No need to put if off any longer. Dr. Berne was highly recommended by my dental surgeon. Immediately I felt comfortable with the staff, and Dr. Berne was attentive, very kind and gentle. Dr. Berne is truly an artist. He even instructed me to bring in pictures of my smile (teeth showing) taken before my surgery so he could recreate my perfect smile. He actually did a wonderful job, right down to the slightly crooked tooth I had in front, and my friends have commented on how beautiful my teeth look. Whether someone needs implants or any other dental appliance, I trust Dr. Berne and his team to get the job done right.